The tiny island nation of the Maldives is under serious threat from rising sea levels caused by climate change. No part of the 1200 islands which make up the Maldives is more than six feet above sea level, so as sea-levels rise (as they will if rampant climate change is not stopped), the entire nation will be under water. Because of this, the Maldives government is pulling out all the stops in the fight against climate change. Not only has the entire country gone carbon neutral, educated all of their children in environmental science and furiously built retaining walls around every island, but the government is buying up land in nearby nations as a place to retreat to when the Maldives disappears. Now it appears that the intrepid Maldivians have come up with a new strategy to fight the rising tide: creating mini floating islands! The Maldives government and Dutch Docklands/Dutch Watervalley just signed an agreement today to develop several floating facilities for the islands, including a convention center and golf courses. Designed by architect Koen Olthuis of Waterstudio.NL, the people who brought you the Citadel floating apartment complex and these amazing floating homes, the renderings for the amphibious mini-cities appear depict star-shaped, tiered islands with indoor spaces hidden under lush green-roof terraces, complete with interior pools and beaches. While exact design details of these new floating islands are still unavailable, we do know that Dutch Docklands knows a thing or two about creating water developments using methods and procedures that reduce impact on underwater life and minimize changes to coastal morphology. We also know that architect Koen Olthuis is a force to be reckoned with, so we can’t wait to see these creative designs come to fruition. At the signing ceremony, Mahmood Razi, Chairman of the Privatisation Committee said the Maldives plans to seek the assistance of Dutch Docklands to develop floating housing units in the Maldives in the future. NEWS RELEASE March 22, 2010 Virtual state to acquire physical territory from Maldives Wirtland, the first sovereign cybercountry, has announced plan to legitimately acquire real land from one (or even several) world's countries. If realized, it will be the first case of peaceful formation of a new country “from a scratch”. --- On March 15 Wirtland approached the Government of the Republic of Maldives with a formal proposal to transfer a piece of its territory to Wirtland. “Proposal for Monetization of Unused Land by cooperation between Republic of Maldives and Wirtland” is intended to utilize a small piece of Maldives' unused terrain. According to the Proposal, “Republic of Maldives officially assigns a piece of its territory, of any quality and size, to Wirtland. Maldives will have a major stake in future sales of land from this territory, agreed in contract”. In his letter addressed to the President of the Republic of Maldives, Chancellor of Wirtland underlined his hope that “such a plan, if realized, will make a positive effect on the economy of Maldives”. Thereby the virtual state would take hold of official territory, which later would be offered for sale to people willing to become citizens of new country. The quality and size of territory do not matter: Wirtland will remain virtual community, as no buyer will physically move to Maldives. However, presence of defined territory is a necessary condition for diplomatic recognition of Wirtland by international community, according to Montevideo Convention on the Rights and Duties of States. According to Article 1 of Montevideo Convention, to have sovereignty, a state must have a permanent population, a defined territory, and a government. Wirtland hopes that peaceful acqusition of even a small piece of territory by virtual community will become a unique historical precedent and will open the door towards full official recognition of Wirtland, legitimization of Wirtland passports and other documents issued by virtual state. For a partner country such as the Republic of Maldives, the result of the barter deal is possibility to make money out of otherwise useless land. Maldives' official reaction is not known. Wirtland reserves right to approach other governments with similar proposal. * * * Wirtland describes itself as an experiment into legitimacy and self-sustainability of a country without its own soil. Founded in 2008, Wirtland represents people from all five continents. Wirtland grants citizenships, issues ID cards, mints gold and silver money, is featured in Wikipedia, and has won considerable coverage by television and press. The Republic of Maldives is an island country in the Indian Ocean. It is the smallest Asian country in both population and area. Maldives were among the first nations to open official Embassy in "Second Life" (a virtual world). It should be interesting to see how the legal implications of this play out. If an existing country can create new territory for itself via floating islands, what's to prevent any other country from doing so? Or the creation of a new country? Alternatively if the Maldives loses all its "solid ground" territory to rising waters, might other countries refuse to recognize the sovereignty of these floating islands? Structurally they are similar to ships, so they might not be recognized as Maldivian territory in their own right. And if Maldives loses its solid-ground territory, could it be claimed that Maldives no longer exists as a country? 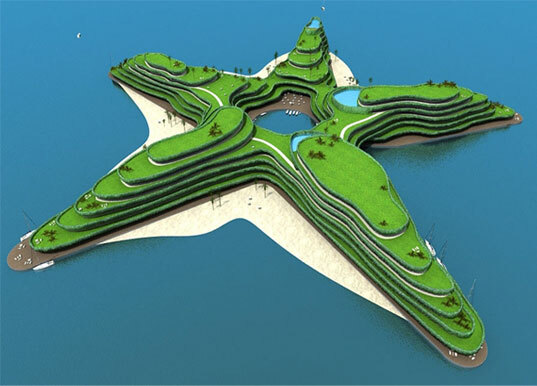 This would put the sovereignty of the floating islands into a legal limbo. 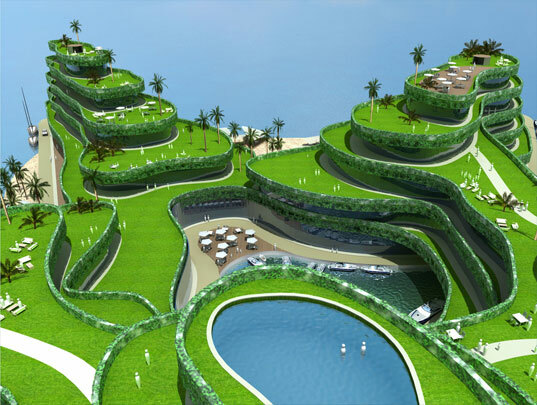 How does building a floating golf course help the Maldives? I'm all for great architecture, but a golf course isn't going to help anyone. This looks fantastic! However whether it would stand up to a hurricane or other elements mother nature throws is another factor.